There are lots and lots of users who use Blogger as a blogging platform search and want to create a static and impressive landing page for their Blogger blogs and probably you are not alone. You might have visited some pro blogger’s site and might have been disappointed that you did not get the desired results for what you searching for, then you have come to the right place. If you follow this post and the steps carefully, everything will be done easily with ease. In this tutorial, you not only able to create a separate page and you would not redirect your readers to a static page. 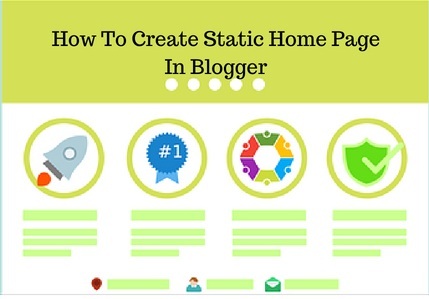 Because this tutorial will demonstrate the basic setup that you can create for your Blogger as a homepage and you can directly design your homepage instead of creating an annoying static page and believe me your homepage will be responsive and user-friendly as you will use only the CSS3 and HTML5 for coding. Note: Replace all the red text and URLs with your own Text, URL, Label or Category or Page. Step 2. Click anywhere inside the template editor area and by pressing Control + F search for </head> tag and paste the below code just above the </head> tag. Step 3. Then search for the <body> tag and paste the below code just after the <body> tag. Step. 4. Click Save in order to save your template and you are done.